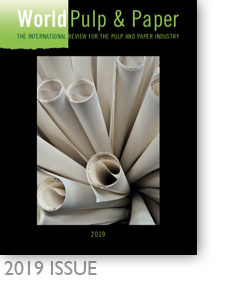 The definitive, in-depth, annual industry review of new technology and state-of-the-art development across the entire spectrum of the pulp and papermaking process. World Pulp & Paper is presented in an outsized A4 format (230mm x 300mm), on a 150 gsm gloss paper. It is the finest annual collection of carefully selected articles from each operating area within the industry. Editorial sources include the mills themselves, the supplier markets as well as eminent independent consultants and industry commentators. World Pulp & Paper is received by name and individually addressed to the Presidents, Mill Managers, Directors of Research and Development and Heads of Production of every pulp and paper mill worldwide. The circulation list is compiled annually and constantly updated by our partner, Fisher International Inc., the world‘s leading consulting and information services provider to the forestry, pulp and paper sectors.